The pet industry rakes in millions a year selling fluffy, colorful things that probably mean more to us than to our fur-kids. While they may not be pretty, our discarded cardboard boxes and paper bags provide just as much enjoyment for cats as manufactured toys – and they’re much cheaper! What is it about these pieces of garbage that hold such allure for cats? Just as many of their activities, their fondness for not only boxes and bags but any small, enclosed space is a behavioral instinct. Cats have a heightened sense of security and an enclosed space provides them with safety. Have you ever thought your cat was missing only to find him sleeping peacefully in the box which your Amazon purchased arrived? Or you’ll find him in your suitcase with only his eyes peering out from the narrow opening of the zipper track. The type of space that is most ideal for felines is not too cavernous – just big enough to fit around their body. With three-quarters of the space walled in, the cat can watch for danger – any would-be assailant would have to pass directly in front of him. The box (or bag) allows a cat to survey his area while hidden. Perhaps the fact that we cannot find them in the house is a bonus. The box is a very comfortable place for a cat to slumber away during the day when most of the household is awake. Cats don’t like to be cold. Sometimes you’ll see them sleeping on the floor where a patch of sun is shining. Tight enclosures allow cats to retain heat and feel most comfortable in environments that are anywhere from 80 to 100 degrees Fahrenheit. Most Americans like to keep their homes at 72 degrees in the summer and perhaps 68 in the winter. That range is not comfortable for a cat which means they will search out a place such as underneath your covers, in your hamper, or in that old delivery box. If your house is colder than your cat likes it, you can purchase a heated pet bed (usually used for newborn puppies and kittens). Put the bed inside a crate and cover the crate with a blanket. Another option is to buy a cat bed shaped like a plush igloo. Your cat will love you for the extra care and attention! Cats are extremely sensitive to light radiation making them ideal predators at night. Even though the common housecat has no need to hunt, he still has the behavioral and physical traits that make him an efficient night time stalker. During the day, they prefer a low-light area to sleep in. Since houses normally have a great deal of light shining in, you will frequently find your cat sleeping in your closet or underneath your bed. The same principle applies to their affinity for boxes and bags; they like the reduced radiation. Cats love to play and they love things that move, make weird noises, and have interesting textures. Paper boxes and paper bags provide all of the above. They love the noise of the bags crinkling and they especially like the feel of tearing the boxes and bags apart. Maybe playing with and ripping into boxes and bags satisfies their hunting instinct too; their play somewhat resembles how they toy with their prey. Ultimately, it grabs our attention – which is also the reason for much of what cats do! Time to Throw Out the Boxes! We love our cats dearly but those cardboard boxes and brown paper bags create an unsightly mess! Let’s give them some substitutes (which may not be good enough in the cat’s opinion). Get that enclosed pet bed. Find some interactive toys that beep, shoot out lasers, and move around. And most importantly – pay attention to them. Cats are seemingly independent but they are needy for human affection. Playing with them and being around for them will ensure that they aren’t left to their own devices. 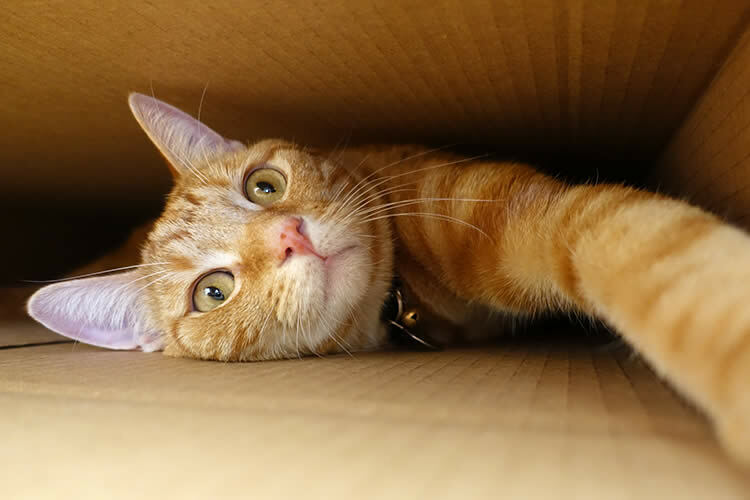 PetMD.com: Why Do Cats Like Boxes? LiveScience.com: Why Do Cats Like Boxes?